Glitter, plastic, corsets, sheer pieces, and logo mania were all over the S/S 18 runways, but that doesn't mean they should be all over the boardroom. But if you want to refresh your work wardrobe for the new season, all hope is not lost. The foolproof way to incorporate a forward feel for spring is to invest in a few pieces that reflect the season's It colours and It prints. Those—along with the outerwear trend that's perfect for the office, the skirt style that's back, the polished denim trend we're seeing everywhere and the classic heels that are getting a fresh update for 2018—are perfect for embracing spring without alarming HR. So leave the plastic corset (yes, it's a thing) for a night out on the town, and instead try these fresh trends for your 9-to-5. 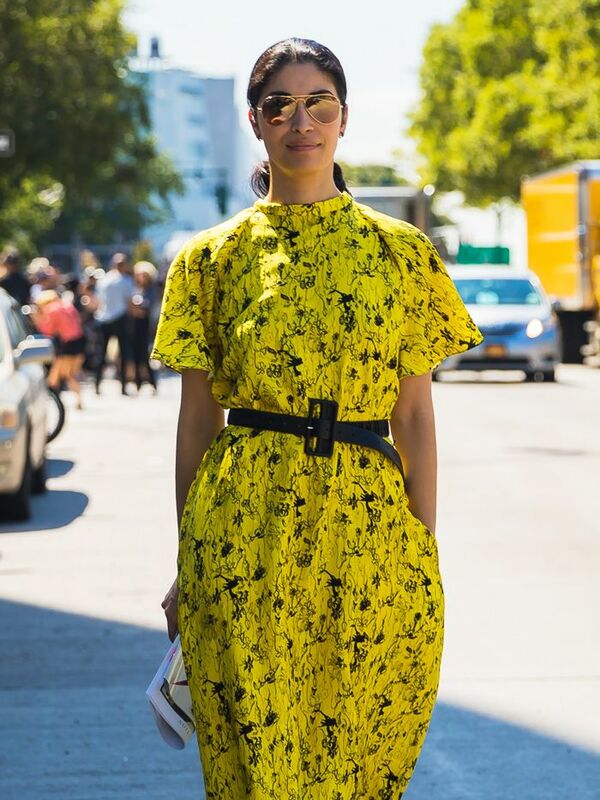 Sorbet-hued pieces scream spring more than ever this year, as the runways of Michael Kors, Tibi, Victoria Beckham, Preen, and many more were flooded with them. Temper the playful hues by pairing with black trousers or a blazer. Pencil skirts for the office aren't exactly revolutionary, but this season, there are more styles than ever to choose from. Try pairing them with heels and a slouchy sweater. Sure, pumps never went away, but this season, they're cooler than ever thanks to unexpected heels and other fresh details. The biggest denim trend of the season just happens to be the most polished, office-appropriate denim trend. Rejoice. Reimagined trench coats were embraced by the likes of Céline, Balenciaga, and The Row. This timeless trend might even have you looking forward to spring showers. The check trend is still going strong, but the pattern is considerably lighter weight for spring. Think cotton and linen in pale neutrals and pastels. Here's to another year of fabulously stylish workwear.